Where, oh where, have you been? From what I hear, while I've been sitting home eating bon bons and getting fat, the dolphins have been just off shore calling for me to come play with them. So, this morning I joined them for a brief swim. They were a little stand offish, but I can't blame them after my neglect. Click HERE or below for a brief video of today's encounter. I had fun swimming with birthday girl, Lisa, this morning. The air and water are getting cooler with the shorter days of fall, so the swim started out a bit on the fast side. Fortunately (for me) people soon warmed up and started to play a little. Bruce was home, but hiding way in the back. Doug danced with a manta ray which led him to an eagle ray. All in all, a great Sunday. Okay, here it is a day late.. I grew up as the oldest son in a lower middle class family in the Midwest with my nose always buried in a book. I didn't just read novels, I fell into them. I always tried to finish a story in one day because I could not return to real life until the book was done. While reading I lived in far off lands in other times - and that was enough. I did not have big dreams in real life, I simply slogged along to the best of my ability. My life turned out far better and more fantastical than I ever dreamed. I routinely swim and play with large groups of wild dolphins, I chase sharks, I swim with baby whales and momma whales, the list continues. I live in a tile roofed villa in a walled complex on the ocean on a tropical island. A sandy beach and beautiful coral formations are steps from my front door. I work for myself as a professional photographer, setting my own hours and choosing my clients. All in all, I have everything to be thankful for. What an amazing life! Now back to real life... The ocean was choppy for my Thanksgiving swim yesterday and I swallowed a mouthful of water every few strokes. One of my swim instructors had always said to "be one with the water," but I don't think they meant it so literally. I encountered this group of twelve Ulua, wouldn't the local fishermen love to know where this was! Click HERE or below for brief video. What a morning! 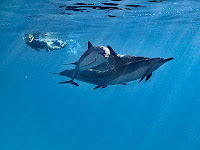 I was joined on my ocean swim by a large group (80 or so) of spinner dolphins. I had a great time with almost two hours of playful interaction. Near the end of my swim several large tour boats showed up and dropped their loads of snorkelers into the midst of the pod (click HERE or below for the video of today's swim). Due to parking congestion (the Maui Century Ride was today) at our usual Sunday swim spot, the few of us who showed up decided to swim elsewhere. We went to the very end of the road, La Perouse bay, which borders a marine sanctuary and swam among lots and lots of beautiful tropical fish (click HERE for more Photographs from today). 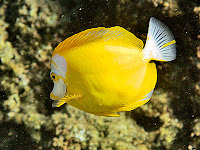 We saw some rather rare fish, including this unusual white faced yellow tang. The tide was high and the water (relatively) calm so we explored small shallow inlets along the way. Click HERE or below for a short video of today's swim. A group of us went camping on Lanai for Pam's 60th birthday. 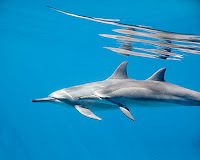 Of course we swam at least twice each day, with additional motivation provided by nearly constant visits of spinner dolphins (Click HERE for photos of the trip). It seems the air matress I lent Patti and Janet has become a sinking mattress, requiring inflation (by very noisy electric pump) periodically through the night. Thank goodness the island did not sink, otherwise they would have been without a flotation device. I am certainly looking forward to going back again next year (Click HERE or Below for the video of this year's trip). I have been totally consumed by my work. Yes, it is fun and interesting being a professional photographer; but dude, Get A Life! I haven't even looked at the video I took from hours spent swimming with spinner dolphins on Lanai two weeks ago. 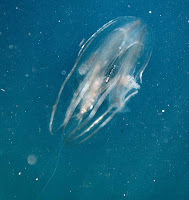 I did get out into the ocean this morning for the first time in two weeks; and ended up in the middle of a group of stinging jellyfish. They must have stung all sense out of my empty head, because I stuck around to photograph them - but forgot to set the focus on my camera. This image is the only one which was anything other than a complete blur.